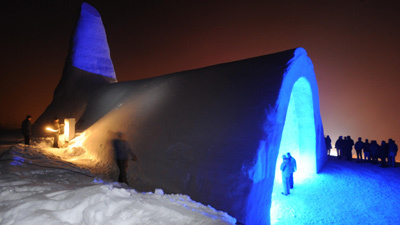 A church built entirely of ice and snow has opened in Bavaria – a hundred years after locals first built a snow church as an act of protest. The church at Mitterfirmiansreut, near the border with the Czech Republic, is more than 20 metres long with an 8 metre steeple and took 1,400 cubic metres (49,000 cubic feet) of snow to complete. The structure was lit up blue with a blessing from local Dean Kajetan Steinbeisser. via One cool church | Orange UK.